While some governments may be more environmentally conscious and apply strict environmental policies, others are not. It’s important, however, that the whole world reaches some form of common ground. After all, we’re all breathing the same air – more or less. Just so you get a finer picture, take note of the fact that 29% of the pollution in the San Francisco Bay Area comes from China, according to a study published in the Environmental Science and Technology. Where industrial facilities are most common, the local area becomes more polluted, but that’s not to say that regions thousands of miles away are protected and kept in pristine condition. Greenhouse gases and particle pollution are airborne and become displaced by air masses. 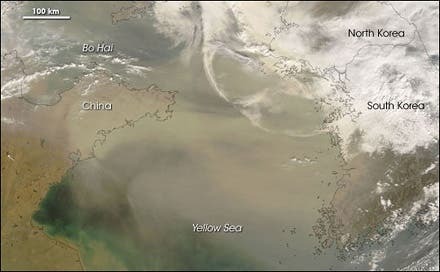 Researchers have known for a long while, for instance, that some of the pollution found in California comes from other parts of the world, particularly China as pollution and dust becomes swept across the Pacific. Led by University of California, Berkeley, postdoctoral researcher Stephanie Ewing, the team of researchers developed a method for tracing fine airborne particulate pollution (also known as PM2.5 because the particles are less than 2.5 microns wide) with origins in East Asia. Basically, the method involves a specific lead isotope, 208Pb, found in greater concentrations in coal and metal ores in the Chinese region, where this type of installations are extremely widespread. China is considered the number one polluting country in the world. The researchers were expecting a considerable figure, but nothing prepared them for this shock. Apparently, after analyzing data from the entire six-month survey, Ewing and her team found that the median proportion of Asian lead in the PM2.5 was 29%. How about that global policy? Wait – there was one, but no one chose to respect it.